nitions, classifi cation and specifications. SMARTPLY OSB3 T&G is a strong, versatile board suitable for structural use in humid conditions (serviceClass 1 and 2), . Uses include flooring, roofing, walling, timber-frame sheathing, temporary works and external hoarding. 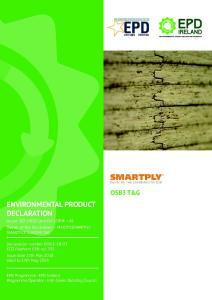 The average density of the SMARTPLY OSB3 panel is 600 kg/m³. Manufactured to the same exacting standards as SMARTPLY OSB3 but with the addition of tongue and grooved edges.